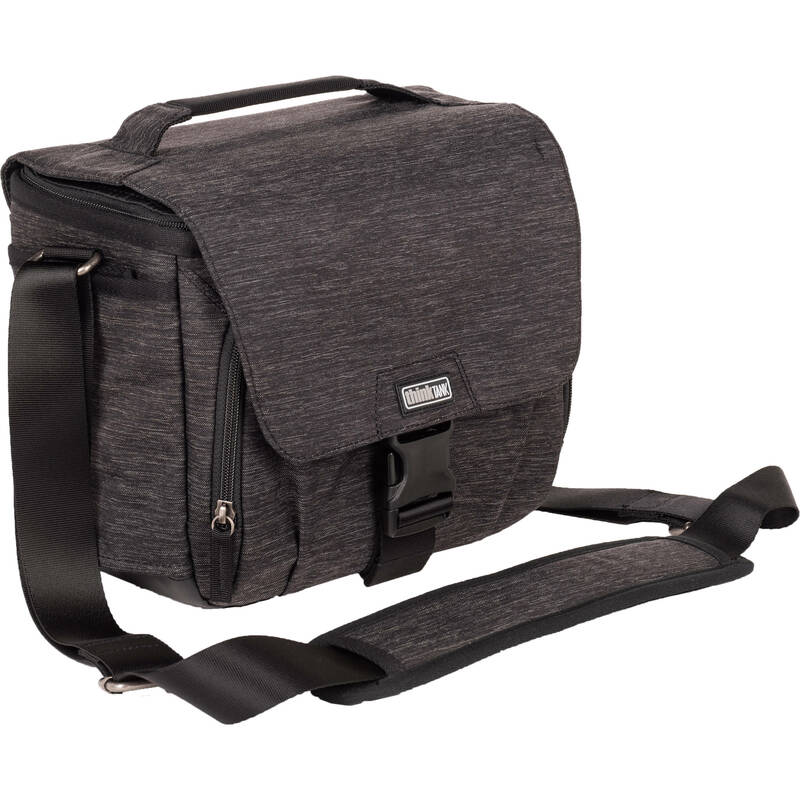 This graphite-colored, Vision 10 Shoulder Bag from Think Tank is a versatile, messenger-style camera bag that can accommodate a medium-sized DSLR with two to three lenses, including a detached 24-70mm f/2.8 lens. If used to hold a mirrorless camera kit instead, three to four lenses can be carried, including a detached 50-140mm lens. Within the Vision 10's main compartment, which includes a pocket for a 10" tablet computer, two padded, adjustable dividers can be configured according to the specific camera equipment being carried. Unlike many camera bags of its kind, the Vision 10's main compartment features its own zippered lid for use under the bag's front flap, enhancing security and protection from the elements. Aside from being able to hold photo gear along with a tablet, this bag also provides multiple pockets within a zippered front panel to organize pens, business cards, portable batteries, memory card wallets, and a large-screen mobile device. To reach the zippered front panel or the main compartment, the Vision 10's front flap can be opened by first unfastening its large, side release buckle. Pulling back the front flap also grants access to the slip pocket along the outside of the front panel, which can comfortably store assorted maps, notebooks, or documents. While its padded, adjustable shoulder strap allows this bag to be worn along or across the body, the Vision 10 can also be carried using its built-in top handle. Featuring durable nylon and polyester construction with a waterproof, abrasion-resistant bottom, this bag also includes a seam-sealed cover for use under heavy rain. While traveling with a rolling case that has a telescoping handle, a pass-through band across the rear panel allows the entire bag to be mounted onto such handles for added convenience. Box Dimensions (LxWxH) 12.2 x 10.1 x 6.5"